(Gallup, NM): Artist Ric Sarracino has donated a portrait of Octavia Fellin to the Octavia Fellin Public Library. 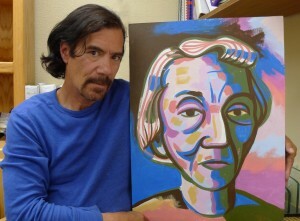 He painted Ms. Fellin in 2009 as part of a series of twenty-five famous Gallup residents. Each of the paintings was completed in an hour using one brush and nine colors. Octavia Fellin was Gallup’s Library Director from 1947 to 1990 and upon her retirement the library was named in her honor. Ms. Fellin had been offered a position with the San Francisco Public Library. However, on her way she stopped in Gallup to visit her family, volunteered at the library and never left. She was committed to building quality library services, programs, and a collection for the community she loved. Ms. Fellin touched the lives of three generations and knew everyone by name. She was a lifetime member of the New Mexico Library Association and involved in the New Mexico Municipal League. Ric Sarracino is a painter and playwright. He is noted for his portraits and murals depicting Gallup’s rich culture including: Hispanic Heritage, Gallup Community Life, and the Japanese Mural honoring Medal of Honor recipient Hiroshi Miyamura. He is always interested in feedback concerning his work and can be reached at ricsarracino@yahoo.com.